Oregon State University alumni Janice Levenhagen-Seeley and Jennifer Davidson returned to Corvallis last weekend to host a 2-day event to encourage high school girls to enter technology fields. Both graduates of the School of Electrical Engineering and Computer Science, Levenhagen-Seeley is the founder and executive director for ChickTech, a Portland-based non-profit, and Jennifer Davidson is the program manager. Participants of the ChickTech event built robots, video games, smartphone applications, websites, light-up textiles, and 3-D printable projects like figurines or pendants. It was an eye-opening experience for many who said they had no idea what went on behind the technology they use every day. That revelation is just what Levenhagen-Seeley was hoping for. She created the Portland-based non-profit organization in 2012 to foster a more inviting culture for women in technology, and in particular for opening the door of technology fields as a career option for high school girls. “In high school I really enjoyed math but no teachers or career counselors ever thought to mention to me, ‘You should try this programing class,’ or ‘You should check out engineering as career,’” said Levenhagen-Seeley who majored in computer engineering. ChickTech involves high school teachers by asking them to nominate female students in their classes who have the aptitude for careers in technology but have not sought out opportunities to learn more. Phoenix Brooks from Veneta said she was nominated by her teacher at Triangle Lake Charter School and her principal encouraged her to take the opportunity. She chose the workshop on website development because she felt like no matter what career she went into, it would be useful. Phoenix Brooks, from Veneta, Ore., learned to create her own website. Haley Payne of West Albany High School and Audrey Hysell of Lebanon High School teamed up to create an underwater version of the Flappy Bird mobile app in which fish navigate hazards such as fish hooks, anemone and sharks. “We haven’t yet got the fish to die when they hit something, but we’ll get there,” said Payne with confidence. By the end of the day, they were able to show off their finished app to visitors at who attended the Tech Show. It is that kind of “win” that Levenhagen-Seeley wanted the high school girls to be able to experience and what motivated her to organize a longer event for the Corvallis chapter. ChickTech’s first event for Corvallis last year was a day-long workshop which was not enough time to create a finished project. Since many of the girls travel from as far away as Newport, the addition of an overnight stay in the dorms made the event possible but also added a new dimension. “The overnight stay was a really exciting component because the girls were able to bond a lot more,” Levenhagen-Seeley said. The event was made possible by volunteers from Oregon State, Garmin, Hewlett-Packard, and Intel. Funding was provided by OSU’s School of Electrical Engineering and Computer Science, OSU’s Women & Minorities in Engineering, Garmin, Tektronix, HP, Phase2, Kattare, and Korvis. ChickTech has three chapters in Corvallis, Portland, and San Francisco, but is expanding nationwide to add 5 chapters next year, and 8 in 2016. 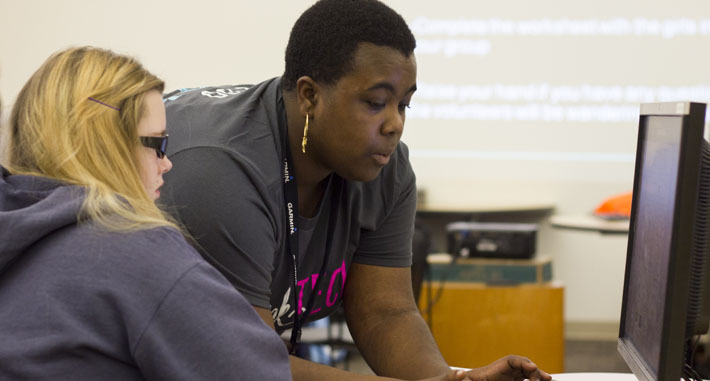 ChickTech is hosting a workshop on Aug. 23-24 at Oregon State University to encourage high school girls to enter computing and technical fields. The event culminates with a show on Sunday, Aug. 24, that’s free and open to the public. It will be from 4:30-5:45 p.m. at the Kelley Engineering Center on the OSU campus, and participants will display the projects they built. The students may help create a robot, build a video game, or make a smartphone application, and are mentored by industry and academic professionals from high-tech fields. The event is free for participants, and includes an overnight stay in an OSU residence hall. It’s sponsored or supported by the OSU School of Electrical Engineering and Computer Science, the Women and Minorities program, the OSU Library, Tektronix, HP, Kattare, and Korvis. The event is designed as a fun, positive learning experience to build participants’ confidence in their technical abilities, provide positive role models, and create connections with other young women from the area. 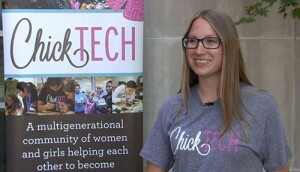 ChickTech is a non-profit organization, founded in Portland in 2013 by OSU alumna, Janice Levenhagen-Seeley, who was motivated by her own experiences to foster a more inviting culture for women.